The Augustinian theodicy, named for the 4th- and 5th-century theologian, philosopher and (according to some Christian denominations) Saint Augustine of Hippo, is a type of Christian theodicy designed in response to the evidential problem of evil. As such, it attempts to explain the probability of an omnipotent (all-powerful) and omnibenevolent (perfectly loving) God amid evidence of evil in the world. A number of variations of this kind of theodicy have been proposed throughout history; their similarities were first described by the 20th-century philosopher John Hick, who classified them as "Augustinian". They typically assert that God is perfectly (ideally) good; that he created the world out of nothing; and that evil is the result of humanity's original sin. The entry of evil into the world is generally explained as punishment for sin and its continued presence due to humans' misuse of free will. God's goodness and benevolence, according to the Augustinian theodicy, remain perfect and without responsibility for evil or suffering. The theodicy was criticised by Augustine's contemporary Fortunatus, a Manichaean who contended that God must still be somehow implicated in evil, and 18th-century theologian Francesco Antonio Zaccaria criticised Augustine's concept of evil for not dealing with individual human suffering. Hick regards evil as necessary for the moral and spiritual development of humans, and process theologians have argued that God is not omnipotent and so cannot be responsible for any evil. The logic of Augustine's approach has been adapted by Alvin Plantinga, among others. Plantinga's adapted Augustinian theodicy, the free will defence – which he proposed in the 1980s – attempts to answer only the logical problem of evil. Such a defence (not a "theodicy" proper) does not demonstrate the existence of God, or the probable existence of God, but attempts to prove that the existence of God and the presence of evil (or privatio boni) in the world are not logically contradictory. Some criticisms have also been derived from science, as aspects of the Augustinian theodicy (specifically, the fall of an originally good creation) run contrary to scientific consensus regarding the beginning of the world and the development of life. The Augustinian theodicy supports the notion of original sin. All versions of this theodicy accept the theological implications of the Genesis creation narrative, including the belief that God created human beings without sin or suffering. Evil is believed to be a just punishment for the fall of man: when Adam and Eve first disobeyed God and were exiled from the Garden of Eden. The free will of humans is offered by the Augustinian theodicy as the continued reason for moral evil: people commit immoral acts when their will is evil. The evil nature of human will is attributed to original sin; Augustinian theologians argue that the sin of Adam and Eve corrupted the will of human beings, maintaining that God is blameless and good, and not himself responsible for evil. Augustine of Hippo (354–430 AD) was a philosopher and theologian born in Roman Africa (present-day Algeria). He followed the Manichaean religion during his early life, but converted to Christianity in 386. His two major works, Confessions and City of God, develop key ideas regarding his response to suffering. In Confessions, Augustine wrote that his previous work was dominated by materialism and that reading Plato's works enabled him to consider the existence of a non-physical substance. This helped him develop a response to the problem of evil from a theological (and non-Manichean) perspective, based on his interpretation of the first few chapters of Genesis and the writings of Paul the Apostle. 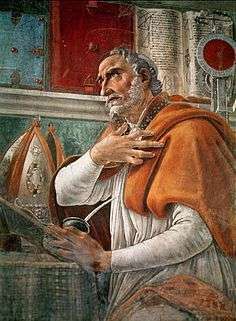 In City of God, Augustine developed his theodicy as part of his attempt to trace human history and describe its conclusion. Augustine believed that a physical Hell exists, but that physical punishment is secondary to the punishment of being separated from God. He proposed two reasons for this: Firstly, humans have free will, and only those who choose to follow God will be forgiven and able to avoid Hell. Secondly, he believed that Adam and Eve's choice to sin affected our free choice, and that humans are left unable to resist sin. Augustine proposed that the grace of Jesus Christ freed humans from original sin, but he maintained that humans can only be saved if they choose to receive grace, and that this choice is formed by the character of individual humans. 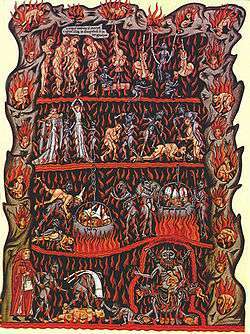 Accepting that even those who will be saved continue to sin, Augustine proposed that those who choose God's grace will still go to Hell for a time to purge them of their sin, before going to Heaven. 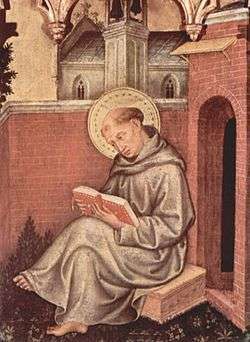 Aquinas supported Augustine's view that evil is a privation of goodness, maintaining that evil has existence as a privation intrinsically found in good. The existence of this evil, Aquinas believed, can be completely explained by free will. Faced with the assertion that humans would have been better off without free will, he argued that the possibility of sin is necessary for a perfect world, and so individuals are responsible for their sin. Good is the cause of evil, but only owing to fault on the part of the agent. In his theodicy, to say something is evil is to say that it lacks goodness which means that it could not be part of God's creation, because God's creation lacked nothing. Aquinas noted that, although goodness makes evil possible, it does not necessitate evil. This means that God (who is good) is not cast as the cause of evil, because evil arises out of a defect in an agent, and God is seen to be without defect. Philosopher Eleonore Stump, considering Aquinas' commentary on the Book of Job, argues that Aquinas has a positive view of suffering: it is necessary to contrast Earth with heaven and remind humans that they still have the propensity to commit evil. Aquinas believed that evil is acceptable because of the good that comes from it, and that evil can only be justified when it is required in order for good to occur. Attempting to relieve God of responsibility for the occurrence of evil, Aquinas insisted that God merely permits evil to happen, rather than willing it. He recognised the occurrence of what seems to be evil, but did not attribute to it the same level of existence that he attributed to spirituality. Like Augustine, Aquinas asserted that humans bear responsibility for evil owing to their abuse of free will. The Italian theologian Francesco Antonio Zaccaria criticised Augustine's concept of evil in the eighteenth century. He noted a distinction between using the term evil to imply blame (sin) and to imply lament (suffering) and argued that Augustine posited sin to have occurred before suffering. This was problematic for Zaccaria, who believed that it made Augustine seem offhand and uninterested in human suffering. For Zaccaria, Augustine's perception of evil as a privation did not satisfactorily answer the questions of modern society as to why suffering exists. In the 1980s, Alvin Plantinga presented a version of the free will defence which, he argued, demonstrated that the existence of an omnipotent benevolent God and of evil are not inconsistent. He believed that, unless it could be shown that the two are not inconsistent, they would be necessarily contradictory. To do this, Plantinga believed that a "possible state of affairs" must be proposed which, if actual, would make God's existence and the existence of evil consistent. He argued that a third proposition – that evil is the result of the actions of free, rational, fallible human beings – allows the existence of God and evil to be consistent. Plantinga supported this argument by claiming that there are some things that an omnipotent God could not do, yet remain omnipotent – for example, if an omnipotent God has necessary existence, he could not create a world in which he does not exist. For this reason, Plantinga argued that an omnipotent God could not create any universe that he chooses, as Leibniz had proposed. He suggested that, even in a world where humans have free will, their actions may be so predictable that God could not create a world where they would do something unpredictable. [lower-alpha 1] Finally, he argued that if every moral agent freely makes at least one bad moral decision in any possible universe, God cannot create a universe where there is human freedom and no evil. Plantinga maintained that the existence of an omnipotent, benevolent God and the existence of evil are not inconsistent. Supposing that the evolutionary theory, the current consensus, is correct, John Hick criticised Augustine's theory for being "implausible" in light of Darwin's theory of evolution, as it would make Augustine's idea of a fall from perfection inaccurate; this is reiterated by professors Nancey Murphy and George Francis Rayner Ellis, who also contend that Augustine's idea of transmitting original sin from Adam to the rest of humanity requires biological explanation. Professor of Comparative Religion Arvind Sharma has argued that natural evil cannot be the result of moral evil in the way Augustine suggested: scientific consensus is that natural disasters and disease existed before humans and hence cannot be the result of human sin. ↑ Tooley, Michael (21 August 2009) [16 September 2002]. "The Problem of Evil". Stanford Encyclopedia of Philosophy. Retrieved 8 February 2012. ↑ Mendelson, Michael (12 November 2010) [24 March 2000]. "Saint Augustine". Stanford Encyclopedia of Philosophy. Retrieved 9 October 2011. ↑ "Saint Thomas Aquinas". Stanford Encyclopedia of Philosophy. 30 September 2009 [12 July 1999]. Retrieved 10 April 2012. Augustine of Hippo (fifth century). The City of God. Wikisource. Augustine of Hippo (392 AD). Acts or Disputation Against Fortunatus the Manichaean. Wikisource. Geivett, R. Douglas (1995). Evil and the Evidence For God: The Challenge of John Hick's Theodicy. Temple University Press. ISBN 978-1-56639-397-3.